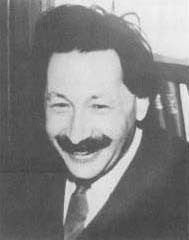 Ernst Boris Chain (1906-1979) was one of three men (Australian biochemist Howard Walter Florey and Scottish chemist Alexander Fleming completed the trio) who discovered and developed the first antibiotic, penicillin. Chain's parents were Russian Jews who had emigrated to Berlin, Germany. He was educated at a Gernan university, but emigrated to Britain in 1933 to work at Cambridge University, where he studied enzymes and molds. His first discovery was about the behavior of bacteria. Chain found that they helped to spread infections by excreting an enzyme. Chain began his collaboration with Florey (1898-1968) in 1939. Chain had noticed Fleming's (1881-1955) writings about how molds, essential to the development of penicillin, had killed bacteria in one of his sample dishes. Unfortunately, Fleming had not found a way to purify or concentrate his discovery. By 1941 Chain and Florey had accomplished what Fleming had not be able to do: isolate and test penicillin on humans. The results of the tests were outstanding, and mass production of penicillin soon followed. Chain also discovered that bacteria could develop a resistance to penicillin, so he worked on the development of other antibiotics as well. After he shared the 1945 Nobel Prize with Florey and Fleming, Chain noticed that many post-war universities had gone back to an atmosphere of competitive, secretive research, which he did not like. In response he started two new research institutions, one in Rome and one in London, which maintained an atmosphere of cooperation and openness, thus setting the trend for our international research collaborations of today. chain studied both music and chemistry under composer Borodin, who was also an organic chemist and who advised him to stick to chemistry, which he did. But when he became professor of biochemistry at imperial college and lived in a penthouse flat in the biochemistry building, they had to take out the picture window to get in chain's and his wife's two grand pianos by crane. Alexander Borodin, famous Russian composer, was also a world-class chemist. But he died in 1887, long before Ernst Chain was born.